Learn here how to fill the ink cartridge PG-140, follow the steps and if you have any other preguta, just type a comment. The ink cartridges Canon PG-140 FINE type, allows us to print about 180 pages with pigmented ink, this cartridge factory has about 8 ml of ink. 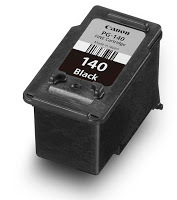 When we fill the PG-140 cartridge must put at least about 12ml of ink, do your best to get pigmented ink for this cartridge, it is the only way to ensure stable performance and the best possible print quality, almost like when new. The ink cartridge PG-140XL should put a 20ml ink for average 350 pages, this cartridge is recommended for most printers ink systems for strength and support more ink therein. These cartridges have a great resemblance to the PG-240, the filling process is the same, as you know before refilling an ink cartridge to put it on a surface which is easy to clean paper or cloth or some black color, about not spotting or damage with ink. Provide as much ink cartridge you have, remember that the amount varies if the ink cartridge is version XL (extra large) or standard version. Before completing any ink cartridge must remove the label to avoid damaging the glue with ink, it is not recommended to fill the cartridge by drilling holes to the label, even if you know exactly where drilling is going. The label serves to pass the exact amount of air cartridge for proper operation. For these cartridges it is needed to make larger holes with tools like drill bits for walls when drilling with the same syringe needle helps provide the exact amount is made. If we make the hole with the same syringe (though difficult) when the ink cartridge is filled completely, voted ink by the printhead. It is possible that the ink cartridge spill a little, we should clean only the bottom of the cartridge where the cartridge nozzle is located. Do your best not to touch the contacts on the cartridges, they are in front of it, are some dots that make contact with the printer. When an ink cartridge is refilled ink may not reach the head immediately to bring ink and get good quality prints the following are recommended cleaning or print a test page. In case of not knowing how to do the cleaning head it is convenient to print a completely black page.